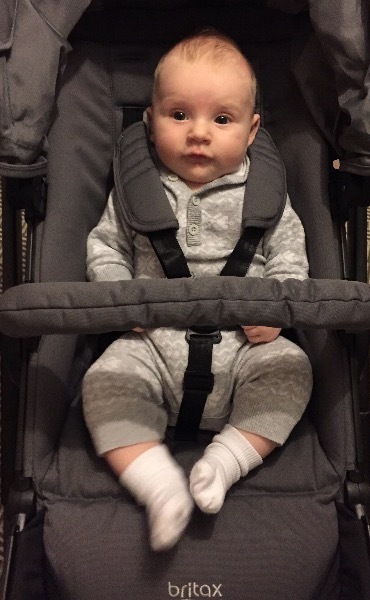 This is the feedback thread for those of you who are testing the Britax B-READY travel system for us as part of our latest MadeForMums product test. You should all have received your buggy (or it's speeding its way to you right now!). Do have fun testing it out with your baby and please also take some pictures of your child in the buggy. 3. How do you find using the pushchair? How do you find it to handle, push and manoeuvre? 4. Which features of the pushchair do you like the most? 5. If you tested the Britax B-READY with more than one child in it, how easy was it to adapt the pushchair to carry two children? 6. 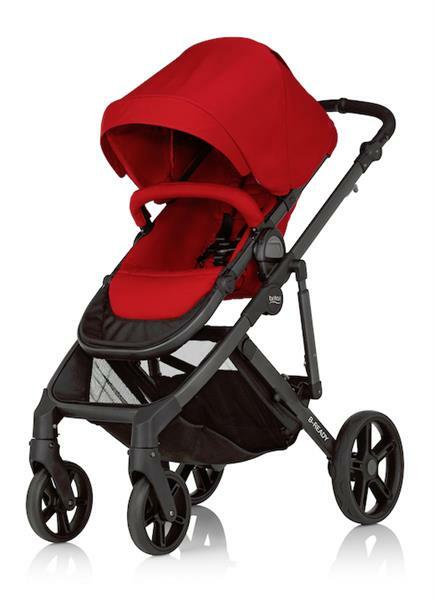 Would you recommend the Britax B-READY to another parent or parent-to-be? Everyone who leaves quality feedback and answers all 6 of our questions (and is part of our product test) will be put into a draw to win a £100 Amazon voucher. Thank you so much – and good luck! Fab news BabyTree! Can't wait to hear how you get on with it! I've still not received mine. This doesn't leave me a lot of time to test it, take pictures and review it by Friday! Please can you tell me when I should expect it? Hi MrsO1, we will look into this urgently and let you know what's going on as soon as we find out. Please bear with us. Hi everyone, we’re aware some people haven’t got their buggies yet and we’re on the case. We will update you as soon as we know more. 1. When I first received the Britax stroller, it was bigger than I expected. I thought the frame was quite big and the pram itself stands quite high. One good point from this so far is the big shopping basket on the bottom. I think this would be a struggle for anyone who goes on public transport. 3. The pushchair is fairly easy to use & comfortable to push. It also feels very sturdy when pushing & going up & down curbs. I love the clip in/clip off feature. This makes it a lot easier when getting the pushchair in & out of the house. The pushchair is fairly easy to fold & unfold with the handy clip in feature. The pushchair frame also fit very well into the back of my smallish car (audi a2) which I didn't think it would. 4. The features of the pushchair that I like the most are the clip in/out feature. This really helps a mum when getting baby out of the house alone as it makes it quick & efficient. I also like the big shopping basket, this comes in handy when going to Asda. 6. I would definately recommend this pushchair to any parent or mum to be as it is very sturdy and is very safe for all babies. 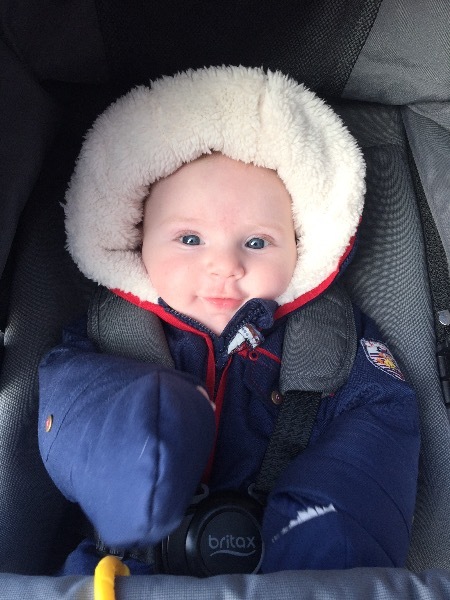 Thanks so much for your feedback, BabyTree – and what GORGEOUS pics! 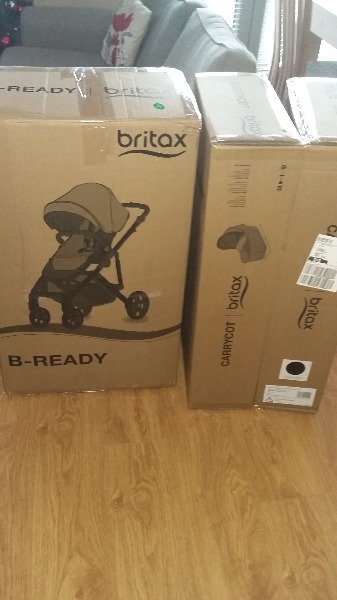 Quick update for those of you who are still waiting for their B-Ready to arrive: we've spoken to Britax and there has been a delay in sending some of the pushchairs out. If you haven't got yours yet, don't panic! We'll give you more time to do your testing – and we're so sorry for the delay. No problem, KazzieM. And sorry to hear your pushchair hasn't arrived either, Sj83. We're on the case, I promise – and we'll update you all as soon as we know more. In terms of extra time for feedback, we'll let you know once we're sure all the pushchairs are where they should be. But basically, don't worry: you'll have enough time to give them a proper test (and we'll take into account that it's Christmas, obviously). 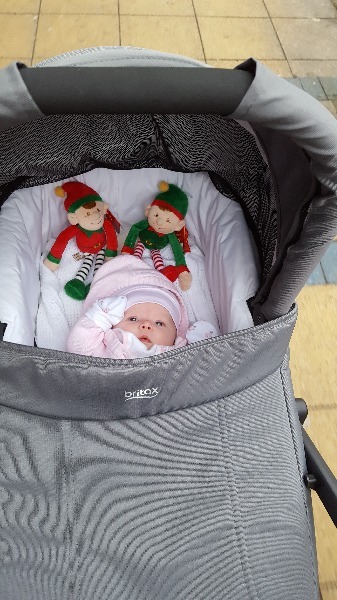 We received our pram last Thursday so have been out and about test driving it. The pushchair arrived in 2 boxes; 1 contained the chassis and the seat unit and the other contained the carrycot. Both were compactly packed so the assembly did not seem daunting. After skimming through the manual, I found the assembly instructions quite confusing as they didn't seem to follow a logical order. On the first page the pictures showed the wheels already attached, then a couple of pages later, the instructions on how to attach the wheels followed! I loosely followed the instructions but later referred to the video on the Britax website just to make sure I'd assembled the pram correctly. When I'd assembled the pushchair, I was really pleased with how smart the pram looked and loved the steel grey colour. It was bigger than I expected but the frame was lovely and strong and sturdy and the seat and carrycot looked very comfortable. On our first trip out I started my son Thomas off in the seat. He is only 3.5 months old but he gets bored of lying down in a carrycot as he loves to look around and take everything in. He absolutely loved sitting upright as it meant he could see everything going on around him. He was really comfortable and I felt happy that he was safe and secure as I was able to adjust the straps to fit perfectly. He 'talked' non-stop and very loudly throughout our shopping trip, I took this as a very positive sign! 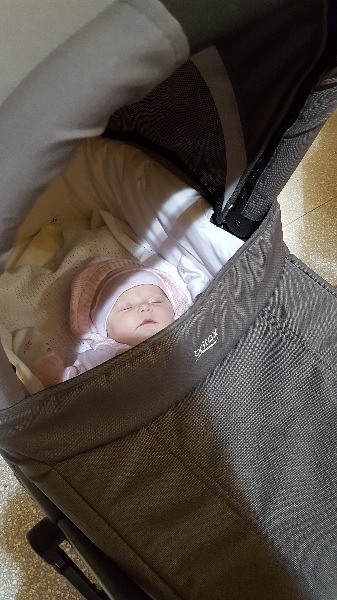 The next day I walked the 2 mile trip in to our local town with the carrycot attached. 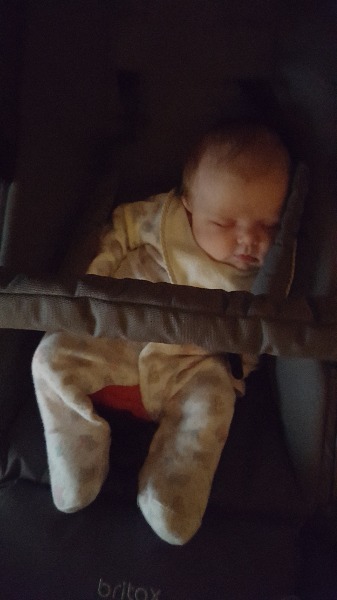 Thomas is quite a big boy for his age in terms of both height and weight so I was pleasantly surprised by the size of the carrycot as he lay in it comfortably and still has space to grow. The mattress was also really thick and comfortable, he was very happy and slept for most of our walk. I didn't use Velcro waist straps to strap him in to the carry cot as I don't think he would have liked this. He loves to kick his legs about so the strap might have been a bit uncomfortable for him however I think this would be a great feature to use with a smaller or newborn baby. I found the carrycot to be quite open and he was more exposed than in our other pram. This didn't seem to bother him at all though, it just gave him more access to the outside world. 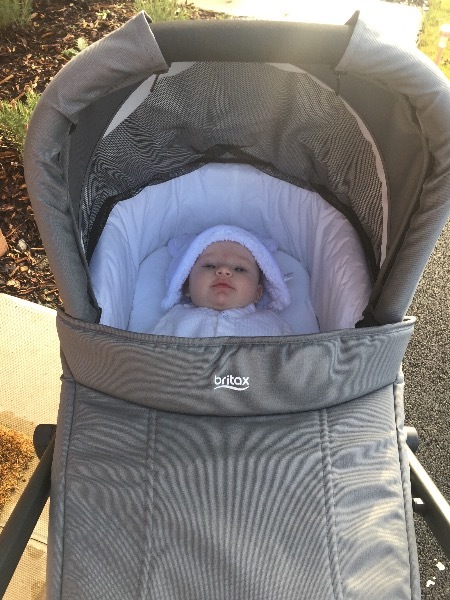 When walking on the pavements I thought that it looked to be a bit of a bumpy ride inside the carrycot as there isn't any suspension on the chassis. This didn't seem to bother Thomas in the slightest but I wondered whether this might cause a smaller or newborn baby to jiggle about in the pram a bit more. 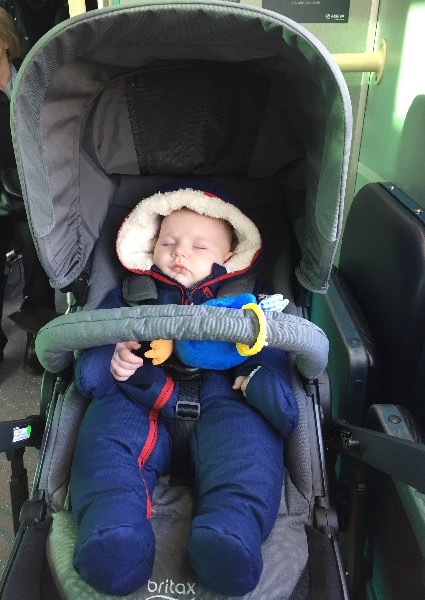 We went on two buses today and I found the pram really easy to manoeuvre on and off and squeeze in to the buggy spaces on the bus. It didn't take up much space at all. We used the seat unit and he slept for most of the journey. I loved that I was able to recline the seat back for him and pull the canopy right over his face so that he could sleep comfortably. It was very light weight to push and lift and the handle was really easy to adjust to suit my height. The front swivel wheels made it really easy to move around small spaces and aisles especially at this time of year in busy shops! 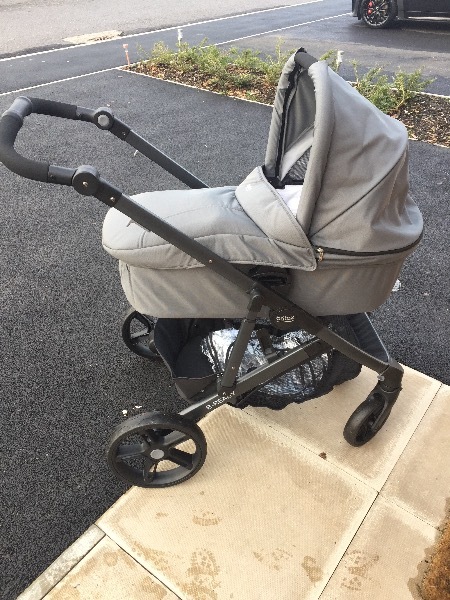 I did however find it quite difficult to push and manoeuvre when walking on pavements with the carrycot attached as I felt that I was pushing against the front swivel wheels most of the time which seemed to have a mind of their own following the natural sideways slope of the pavement. The locking feature on the front wheels did rectify that problem, I just wish I'd have locked them at the start of my walk that day! I love the compactness of the pram. It folds down really small and fitted really easily in to our car boot without the need to detach wheels or the seat unit. I also liked the non puncture feature of the wheels. The week before we received the Britax, I managed to get a puncture in one of the wheels of my other pram which was really inconvenient so it was great to know that this couldn't happen. My absolute favourite feature was the reclinible seat. Although I don't think it is recommended to be used until 6 months, I found it perfect for Thomas. He is in an 'in-between' phase of not wanting to lie down but also not being strong enough to sit completely upright. The seat unit was ideal for him at his stage. I have only used the seat unit facing me, but I like that I will be able to easily switch it around when he is a bit bigger. N/A, only tested with one child. 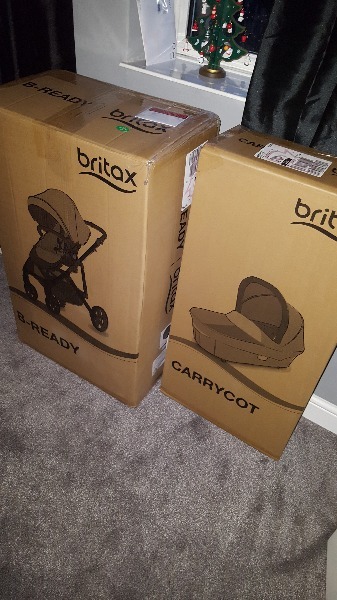 I would definitely recommend the Britax B-READY for anybody who mostly travels by car or public transport as it is so quick and easy to collapse the pram down to fit in to a car boot. It takes seconds to take it out and set up again. It was fantastic for getting on and off buses and doesn't take up too much room. 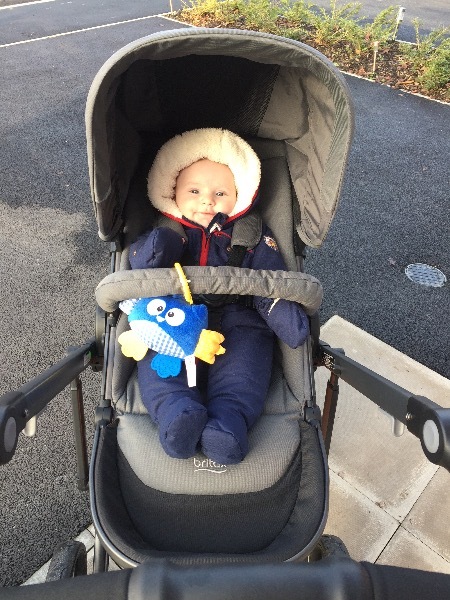 For long walks, I would personally prefer a pram with suspension for a comfier ride, however as I've mentioned, Thomas seemed happy in both the carrycot and seat so that really would be personal preference. Thank you for allowing us the opportunity to test the pram, we've had fun! We have an update! All buggies have now been despatched and left the warehouse - they are coming to you via Yodel and should be delivered at the latest Friday 30 December. Over the next few days, we'll be mailing all of you who haven't had your buggies yet to give you a new deadline for providing feedback.